Marvel's 'The Defenders' Cast Teams Up for NYC Premiere! Charlie Cox (Daredevil), Krysten Ritter (Jessica Jones), Finn Jones (Iron Fist), and Mike Colter (Luke Cage) stepped out for the premiere of Marvel’s The Defenders! The foursome hit the red carpet on Monday (July 31) at the Tribeca Performing Arts Center in New York City. Krysten dazzled in a red cutaway gown and matching bright red lipstick. The group was joined by their co-stars Rosario Dawson, Elodie Young, Deborah Ann Woll, Jessica Henwick, Eka Darville, Carrie-Anne Moss, Simone Missick, Scott Glenn, Elden Henson, and director S.J. Clarkson. Mike‘s wife Iva Colter and Eka‘s wife Lila Darville – baring her baby bump underneath a two-piece ensemble – also stepped out to show their support. In the show, Daredevil, Jessica Jones, Iron Fist, and Luke Cage will team up to fight crime in New York City. Hamming it up with the crew, as you do… #TheDefenders #NetflixAndChill #MarvelUniverse is sooooooo lit! FYI: Krysten is wearing Julien Macdonald. Deborah is wearing J. Mendel. Jessica is wearing a Vionnet dress, Roger Vivier shoes, a Hayward clutch, and De Beers jewelry. Rosario is wearing a Vince Camuto clutch and heels. 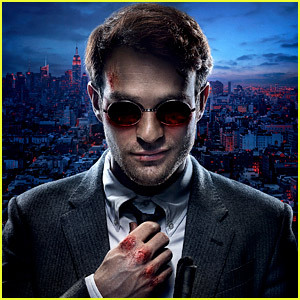 It’s official – the hit Netflix series Daredevil is set to return to the streaming service for a third season! The renewal was announced during a panel for another Marvel television series, Luke Cage, at 2016 Comic-Con on Thursday (July 21) in San Diego, Calif.
“If you like Daredevil, there’s going to be even more Daredevil in season three,” executive producer Jeph Loeb told the crowd. 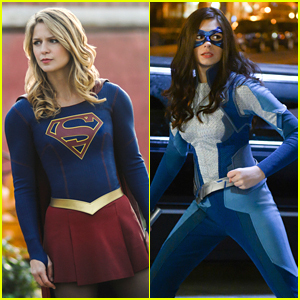 The third season will premiere in 2017 and showrunners Doug Petrie and Marco Ramirez will continue. 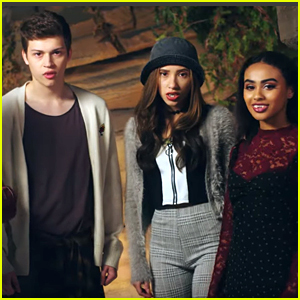 A teaser for the upcoming season was just released and you can watch it below! 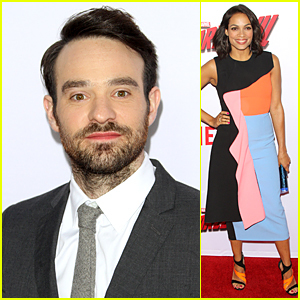 Charlie Cox & Rosario Dawson Say 'Daredevil' Is A Role Model & Hero For Disability! 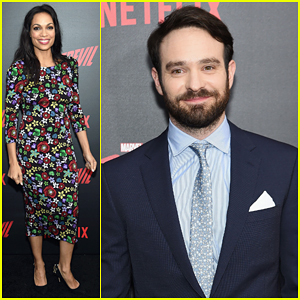 Charlie Cox is dapper in a suit while hitting the carpet at the season two premiere of his hit Netflix series Daredevil held at the AMC Loews Lincoln Square 13 Theater on Thursday (March 10) in New York City. The 33-year-old actor was joined at the event by his co-stars Rosario Dawson, Jon Bernthal, Elodie Yung, Deborah Ann Woll, and Elden Henson, as well as Orange Is The New Black‘s Selenis Leyva, Unbreakable Kimmy Schmidt‘s Tituss Burgess and Jessica Jones‘ Mike Colter, who all came out to show their support. Season two of Daredevil is set to premiere next week on March 18, only on Netflix streaming! Charlie Cox suits up while attending the premiere of his new Netflix show Daredevil held at Regal Cinemas L.A. Live on Thursday (April 2) in Los Angeles. The 32-year-old English actor was joined by his co-stars Rosario Dawson, Deborah Ann Woll, Matt Gerald, Peter Shinkoda, Vincent D’Onofrio, Elden Henson, and Toby Leonard Moore. The day before, Charlie promoted the show during an appearance on Late Night With Seth Meyers. Watch the video below! FYI: Rosario is wearing a Roksanda Ilincic dress and Tamara Mellon sandals with an Edie Parker clutch. Deborah is wearing Marina B jewels. 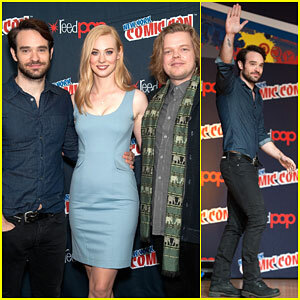 Charlie Cox waves to the audience at the Netflix Original Series Marvel’s Daredevil Panel during 2014 New York Comic Con at the Javits Center on Saturday afternoon (October 11) in New York City. The 31-year-old British actor was joined by his co-stars Deborah Ann Woll, Vincent D’Onofrio, and Elden Henson for the panel. After talking about the show, the cast signed autographs for fans and took pictures with the ones who dressed up. 'Hunger Games: Mockingjay' Stars Hit Up Comic-Con to Premiere New Trailer! Mahershala Ali, Evan Ross, Natalie Dormer, Wes Chatham, and Elden Henson pose for photos while stopping by the Samsung Galaxy Experience during 2014 Comic-Con on Friday (July 25) in San Diego, Calif. The actors are all new additions to The Hunger Games franchise and were there to help launch the trailer for Mockingjay – Part 1. The new trailer for the movie was shown exclusively at Comic-Con that day and now can be seen at Samsung Shops located in Best Buy stores nationwide. Check out some details on what can be seen in the clip!